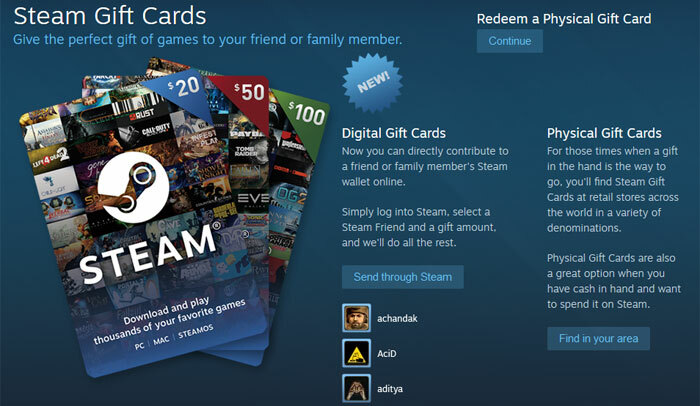 Valve has provided physical Steam gift cards for retailers to sell on for a number of years. These cards first appeared in the UK back in December 2013, though even before that you could pop into some games retailers to hand over cash for steam wallet codes – in a similar way that you might have topped up a PAYG phone. Now Valve has opened up purchasing of Digital Gift Cards on Steam. Perhaps the greatest surprise of this initiative is that it hasn’t happened until now. The new digital cards have some small restrictions. First of all you must log into Steam to purchase one, and secondly you can only send the gift card to a friend or family member. Please note that the friend must have been your ‘friend’ on Steam for at least three days prior to the gifting. One other point to pay attention to is that you cannot use your existing Steam wallet funds to pay for a gift card. A personalised message can be added alongside the gifted funds on the digital gift card. The buyer must work around the gifting restrictions mentioned above, however the recipient will find that the gift is rather flexible. Steam will automatically convert funds into your friend’s currency, and your friend can spend the funds as they wish on Steam; on games, software, hardware, or any other item they can find. If you have Steam wallet funds to buy some games or hardware then Steam’s Halloween Sale is expected to start today and run until 1st Nov. Kotaku also listed ‘leaked’ Autumn and Winter sale dates a few days back. Ah finally! Steam gifts are an awesome way to give prezzies to folks no longer in your real life, especially overseas mates. It's annoying picking out a game because you're not sure they even want that one, letting em have the ability to pick their own game is very welcome.